The Lensbaby Composer Pro II with Edge 35 Optic is a new wide angle tilt lens for use on Canon EF, Nikon F, Sony E, Fuji X, and Micro 4/3 interchangeable lens cameras. The Composer Pro II with Edge 35 Optic will be available in April for $449.95, and by itself as an Optic for those who already own a Composer series lens, for $249.95. Portland, OR -- Lensbaby – makers of award-winning lenses, optics and accessories announces today the availability of its new wide angle tilt lens. The Composer Pro II with Edge 35mm Optic is available for use on Canon EF, Nikon F, Sony E, Fuji X, and Micro 4/3 interchangeable lens cameras. 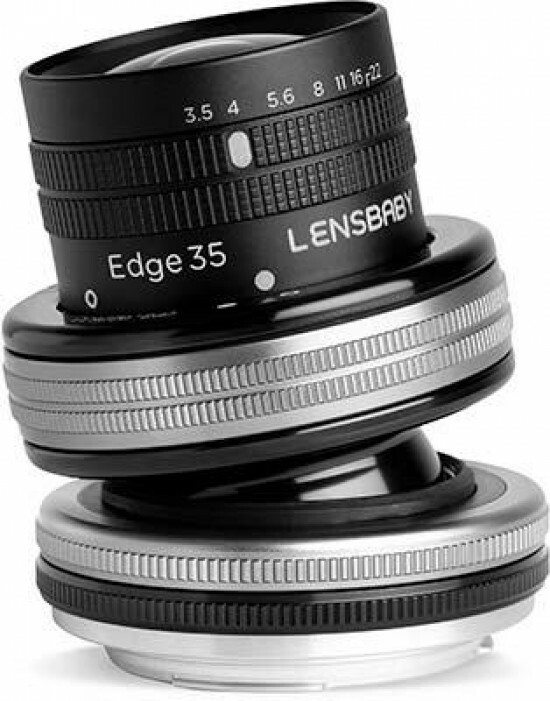 The Edge 35mm Optic is also available separately for anyone who already owns a Lensbaby Composer Pro or Composer Pro II lens body. Fans of this style of selective focus photography have been requesting a wider option beyond the company's existing 50mm and 80mm lenses. The Composer Pro II with Edge 35 Optic is a 35mm f/3.5 tilting lens designed for those looking for a wider focal length to create unique in-camera shots with a slice of tack-sharp focus and detail. By tilting this lens, users can place a slice of sharp focus through objects in both the foreground and background of an image at the same time, bordered by smooth blur. This in-camera effect helps artists tell their story in an uncommon way. “Over the past 15 years, we’ve made optical tools to help you discover unique ways of seeing your world. A 35mm tilt lens, despite being our most requested new product offering since we introduced the Edge 80 in 2012, has been elusive and the results of our efforts have paid off in a lens that is far better than we thought possible when starting our design process. It was worth the wait,” said Craig Strong, Lensbaby Chief Creative Officer and Co-Founder. The Composer Pro II swivels and tilts on a smooth metal ball and socket design, providing a fast and intuitive way to switch between traditional straight lens photos and tilt photography. Tilting the lens up or down results in a horizontal slice of focus; left or right a vertical slice; diagonally for a diagonal slice. After setting the tilt, rotating the focus ring moves that slice of focus through the image, from one side of the frame to the other. The Composer series of lenses are lenses that tilt to move a spot or slice of focus anywhere in the frame. They feature Lensbaby’s Optic Swap System. Users can simply purchase one lens, made up of a lens body with an included optic, for their camera system, then, swap out the optic that it came with for a new optic to completely change the effect and focal length of their Lensbaby lens.